Today I stumbled across a great find for anybody researching their roots in the town of Vicoli. 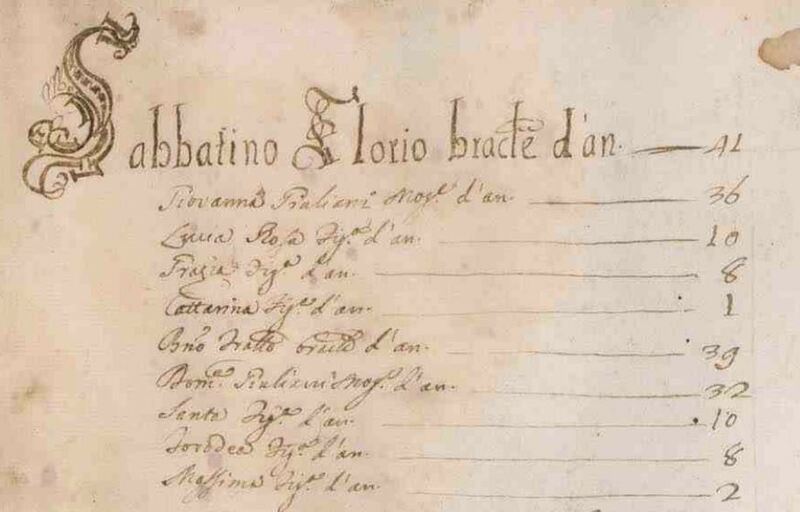 The comune has published the Catasto Onciario from 1752 which basically serves as a census – a record of all families living in Vicoli at time with names, ages, and relation to head of household for each resident. This is a wonderful find because the civil records only take us back to the mid to late 1700s for the most part, and these records help us piece a few more of those branches together. While I personally don’t have any roots in Vicoli that I know of, many of you researching Nocciano and Civitaquana do. The two biggest connections is the SAVINI family (both Nocciano and Civitaquana) and the FLORIO family. As I showed in a post from a while ago, most of the SAVINIs in Nocciano trace back to the couple Michele Savini and his wife Rosalia. I found what must be Michele and Rosalia in Vicoli in 1752, since they hadn’t moved to Nocciano until around 1761. The head of household is Onofrio Savini (b.~1713). Living in the household is his brother Michele Savini (b.~1714), Michele’s wife Rosalia di Giovan Felice (=Gianfelice) (b.~1717), and their children Nicola (b.~1738), Giuseppe (b.~1742), Valerio (b.~1743), and Berardina (b.~1745). Michele and Rosalia had several more children, and then came to Nocciano around 1761 with the children. I’m not sure about their children Nicola and Giuseppe, but I definitely recognize Berardina, who is likely the same Berardina Savini who marries Liborio Marchionne of Nocciano. Valerio may also be Valeriano Savini of Nocciano, perhaps there are two Valeriano’s, as I’ve been told that one in Nocciano is not the son of Michele and Rosalia. There’s also the Taddeo SAVINI family in Civitaquana, he’s born around 1724 and I know the family comes from Vicoli at some point, but he’s not present in the Catasto here so it doesn’t help us. The head of household is Sabbatino Florio (b.~1711). 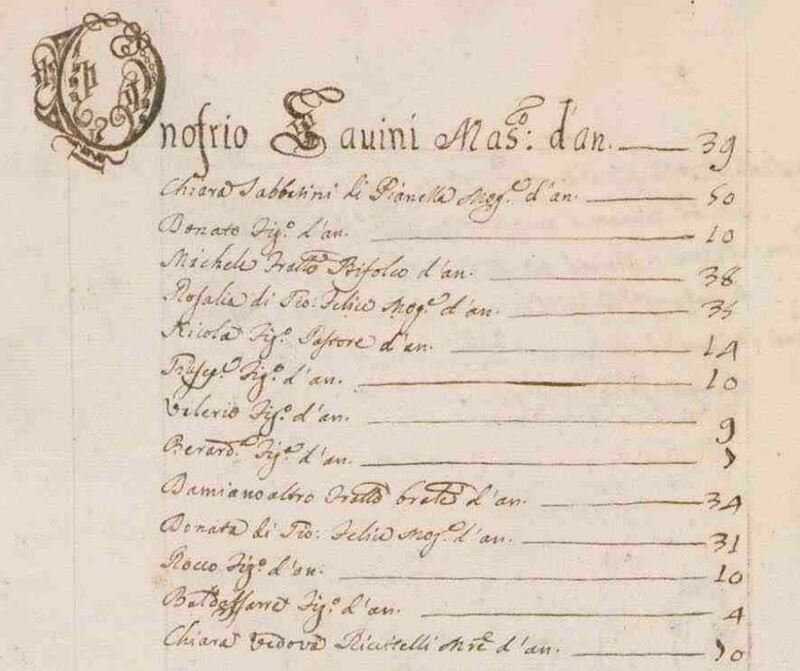 Living in the household is his brother Berardino Florio (b.~1731), Berardino’s wife Domenica Giuliani (b.~1720), and their children Santa (b.~1742), Torodea (b.~1744), and Massima (b.~1750). Torodea is a pretty uncommon name, and the date here matches closely with the estimated birth date of 1739 from her death record (06 Aug 1803) in Civitaquana. Plus, a church census record from Civitaquana confirms her father is Berardino Florio, so it’s definitely her! 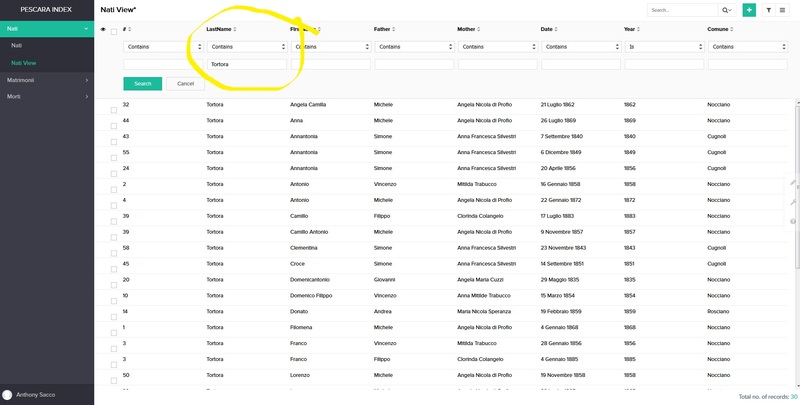 I’ll impatiently await the day when FamilySearch publishes the Catasti for Nocciano, Civitaquana, and all the other towns of Pescara! 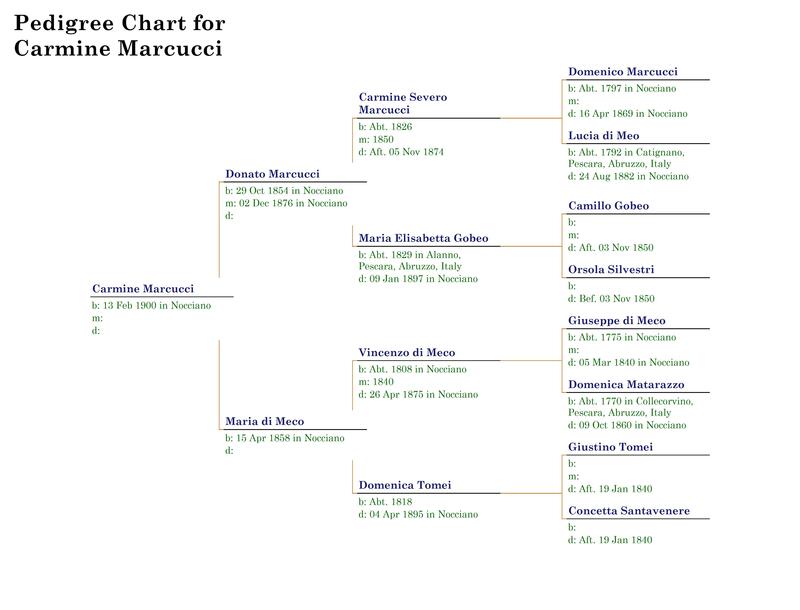 Here is the ancestry of Carmine Marcucci (b. 1900 in Nocciano). The majority of children born at this point are related to my family in one way or another. 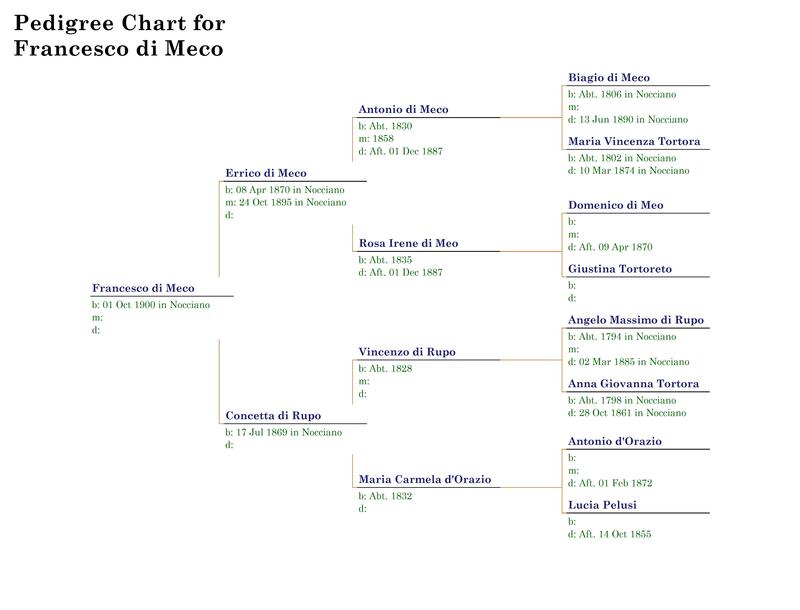 In this case, there are two connections – through Domenico Marcucci (1797-1869) and Domenica Matarazzo (1770-1860), since I have common Marcucci and Matarazzo ancestors with them. Likely di Meco as well, but I haven’t made that connection officially yet. If any of the records I post ring a bell and the child happens to be an ancestor of yours, feel free to let me know! 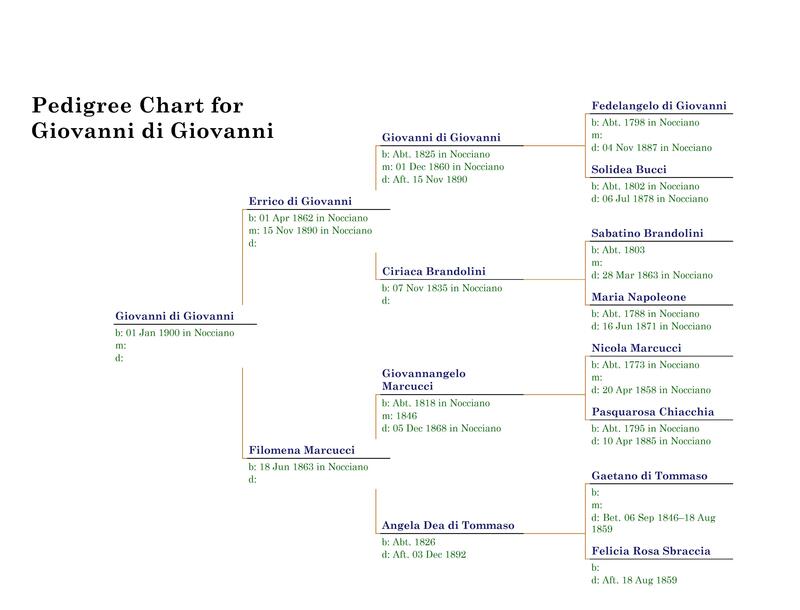 It’s always great to see how I can add to the growing Nocciano genealogy. Just to keep things going in between posting full years’ worth of records on here, I thought I’d start posting daily ancestry charts for various Pescaresi ancestors. Here’s the first, Giovanni di Giovanni b. 1900 in Nocciano. Note that the charts only have 4 generations of ancestors, and may be missing some dates and places. I’ll fill in most of these gaps at some point down the line and subsequently update the ancestry chart. But I wanted to post something in the meantime to help point you in the right direction as you’re going back further, or trying to connect to cousins and such. Right now I’m working on Nocciano records for the year 1900 and Civitaquana records for the year 1849. This was the first record in 1900 births in Nocciano.